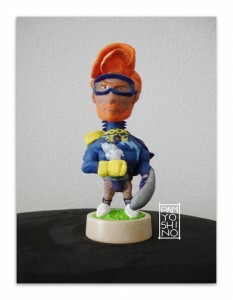 The day after I was laid off last month, my friend Anna sent me a link from the Team Coco site asking for viewer submissions of interpretations of the superhero, “The Flaming C” that Conan and Bruce Timm had cooked up a while back. She encouraged me to send something in. 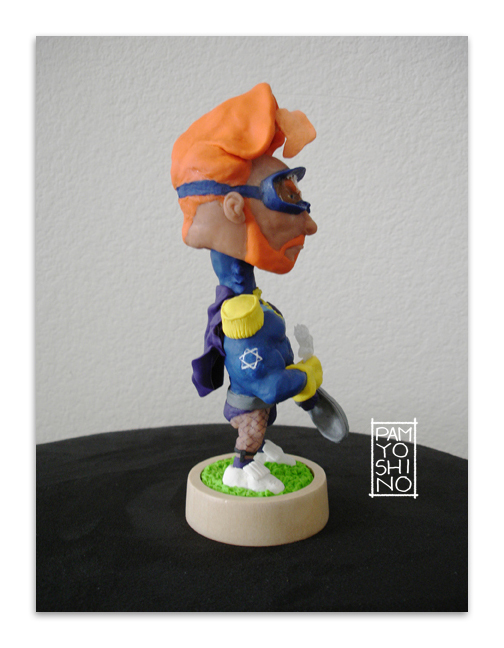 At first I thought I’d do an illustration, but then an idea popped into my head…”how bout a sculpt?” Then another thought…”how bout a bobblehead! 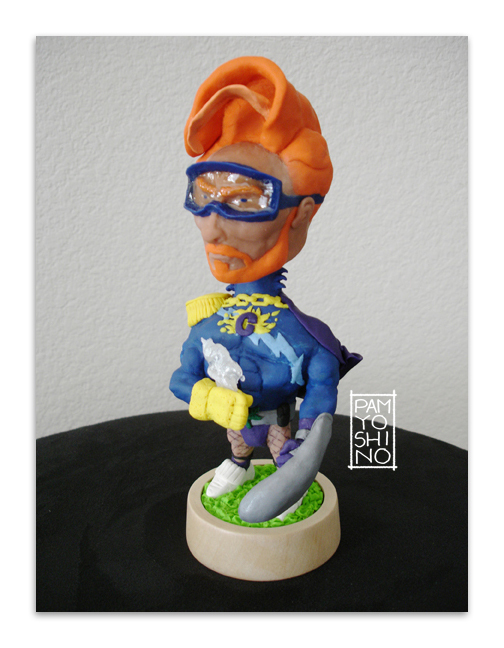 ” Then yet another…”how bout a bobblehead of Conan where his signature hair bobbles too! A bobble within a bobble! A bobble-haired bobble head!” Yes, I never opt for the easy route. I got really motivated and would work on the sculpt at night after spending my days networking with clients, coworkers and friends, updating my resumé, website and digital portfolio and looking at job ads and applying for graphic designer positions. Needless to say, the work didn’t proceed as quickly as I had hoped, but I finally finished it! 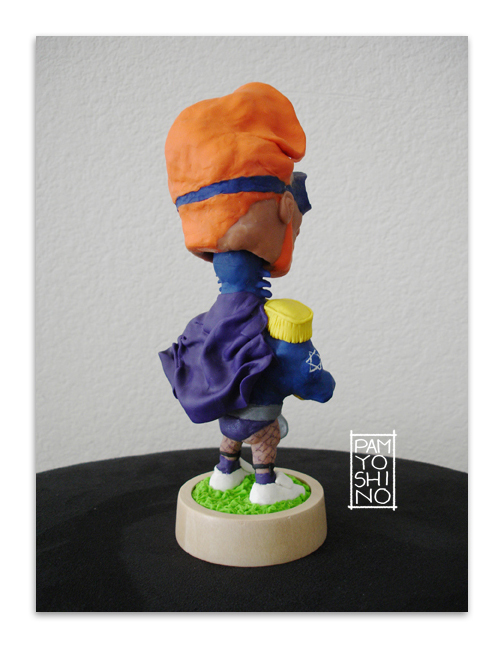 He’s sculpted out of polymer clay over a wire armature wrapped in foil to give it shape. I made the oven mitt smoke and goggles with UV resin. That UV resin is the coolest stuff. I picked it up at a Craft and Hobby Show last year. His base is a wall fitting from an IKEA lamp that I didn’t need. I’m glad I kept it! It was the perfect size! My friend Brian was really great and helped me put together a video of Flaming C in action! I’ll post the process of making The Flaming C soon! Holy C!Great. Where do I get one? Wow! Can you imagine if Conan liked it so much that they did mass produce them?! Yowza! …hey, a girl can dream.